Ah, that makes it a little easier! I would hope so too! It was one of the largest plans in the late 1980s (with the preferred route announced in March 1989), survived the 1994 cuts still on the "Priority 1 List", was cancelled in 1996, then resurrected in downgraded form in 2001 by the West Midlands Area Multi-Modal Study as the Wolverhampton Western Bypass and the Stourbridge Western Bypass. This was then killed off in 2003, but there have been various rumours ever since about a revival of the plan - most notably due to the planned expansion of Wolverhampton Airport, the traffic problems faced by Wolverhampton City Council, and the Black Country Chamber of Commerce suggesting that such a thing would transform the western side of the Black Country in access terms, however the Government continue to insist that the project is very, very dead, and it is not looking likely that it (or anything similar) will ever really be seriously proposed again - something that local residents will probably be pleased to hear! In addition, the recently announced M54 - M6 Toll Link replaced a section of the Western Orbital: the Gailey and Saredon Links. This is why the M6 Toll and M54 have no direct connection between them. Oh? Tell me the story then! A motorway along this corridor (though not on the same route) has been suggested for over 80 years - with the first coming in 1923, when the Northern and Western Motorway was proposed. Whilst the motorway was not a western bypass of the urban areas per se, it followed the corridor on its way between London and Lancashire - though much closer in, some of which is today part of the urban area. However, the proposals didn't last long! In 1934 and again in 1937, the County Surveyors came up with routing ideas for motorways - both of which referred to routes to the west of the conurbation. Then, in June 1943, the new national motorway network was finally being planned. The link that became the M6 would have travelled along a more northerly route, including a crossing of Cannock Chase, and there would have been a link between that and what became the M5, which would have terminated at Lydiate Ash (present junction 4). 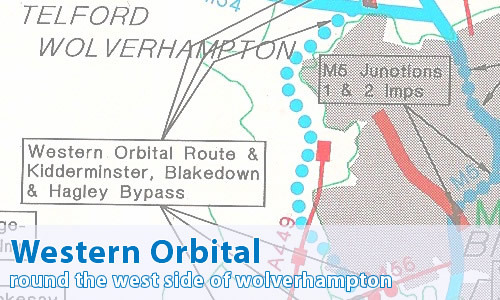 This link was to have headed to the west of the conurbation, with a "backwards" Bilston Link Motorway from A4123 west to the motorway. This was the subject of much debate amongst the nearby local authorities, with some (such as Birmingham City Council) preferring what was then called the "Inner Route", and some (notably Staffordshire County Council) preferring the above "Outer Route", with some (such as Wolverhampton City Council) only having slight preferences. The "Inner Route" took basically the modern M5 and M6 route through the conurbation, but was generally seen as the less favourable route amongst the transport professionals. In 1951, the decision to follow the "Inner Route" was announced, and the west of Wolverhampton route was dead. Or was it? The route never seemingly disappeared completely from the radar in the Ministry. In the early 1970s, there was a serious proposal to resurrect the motorway, with meetings from 1971 to the end of 1975, before the proposals were once again put to sleep. Then came the late 1980s, and the story that you've already seen! How about seeing some maps of the various proposals? Well, that one was most certainly worth waiting for! Interesting how it makes the Might-Have-Been map look - demolishing (or tunneling under) Sedgley is beginning to look very tempting for the mythical Wolverhampton ORR by stealth. And maybe we should vandalise the Lickeys whilst we're on - that would shave off enough of a corner. As someone who grew up in Staffordshire and had family in the West Midlands, this would have been a real boon, must have spent half my childhood in traffic jams being driven (and later driving myself) from Staffordshire to Tipton where my grandad lived. I also remember every summer it taking ages to get to Devon because the M5 only had 2 lanes in places! !